Karel Tresnak Jr. finished first yesterday in the open solo-canoe long-course division of the Kanaka Ikaika State Championships. After a wild start, Karel Tresnak Jr. and Jessie Eames recovered nicely to win the men's and women's open solo-canoe (OC-1) long-course division races at the Kanaka Ikaika State Championships yesterday. 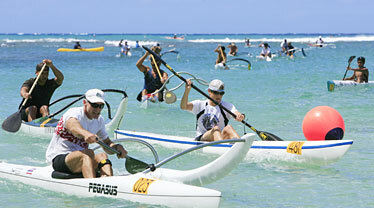 The long-course paddling and surfski races started at Waimanalo Beach Park, heading smack-dab into some sizable sets that tossed more than a few competitors into the water. "The start was horrible. There was 3- to 6-foot waves breaking on top of us," said Tresnak, describing how he was upended by one of the waves. "I had to swim for about a minute to catch up to my boat," he said. Once upright again, Tresnak quickly took command of the race, finishing the 16-mile course in 2 hours, 3 minutes and 37 seconds at Kaimana Beach in Waikiki. Second-place finisher Manny Kulukulualani wasn't as fortunate. Kulukulualani evaded one wave but "got creamed" by another. "I lost a couple of minutes," Kulukulualani said. "My momentum was pretty much destroyed, and I couldn't get it back together." "It's almost impossible to catch up, especially when you're going up against someone like Karel," he said. Kulukulualani finished more than 4 minutes after Tresnak in 2:08:38. Kealii Paiaina finished third in 2:09:20. Aside from the rough patch in the first part of the race, which this year rounded Rabbit Island, "you couldn't ask for better conditions," Tresnak said. "The current was really good, the surf was really good." "It was actually pretty good surf once you got to (Makapuu)." Eames paddled to victory in the women's OC-1 long-course race, finishing in 2 hours, 32 minutes and 13 seconds. The waves toppled her twice, which Eames actually took as a good omen. "Usually, I'm in the water three or four times," she said. "I told myself, 'paddle swift, paddle smart.' "
Eames took an inside line, a tactic she picked up from last week's Oahu championship race from Makai Pier to Magic Island. "I just took the inside and figured if I made a mistake, everybody would make the same one as me," she said. Some of the 195 paddlers in yesterday's Kanaka Ikaika State Championships headed toward the finish line. Kelsa Teeters finished second (2:36:11) and Arlene Holzman (2:37:00) third. "I didn't huli once, which I'm pretty proud of," Teeters said, despite the "pretty big, messy" conditions at the start. But the bumps off Oahu's southeastern shore that aided Eames didn't help Teeters. "The Hawaii Kai part, I think I lost some ground there," Teeters said. "It's more fun, but relatively speaking, I'm not good at (surfing waves)." A total of 195 participants started the race. For the first time, the championships included stand-up paddleboarders, with nine men and two women completing the 9-mile short-course race, which ran from Maunalua Bay in Hawaii Kai to the Kaimana Beach finish. Zsolt Szadovszki, a former Hungarian national team sprint kayaker, won the men's long-course surfski race, claiming his fourth win since moving to Hawaii earlier this year. "I'm learning," Szadovszki said of his adjustment to navigating local waters. Szadovszki clocked in at 1 hour, 58 minutes and 46 seconds, beating Sean Monahan (1:59:51) by just over a minute. Ian Gray (2:00:04) took third place. "I was padding with (surfski paddler) Stu (Gaesnner), and saw that he was probably paddling 50 percent less than me," Szadovszki said. "I said to myself, 'I have to learn what they're doing.' 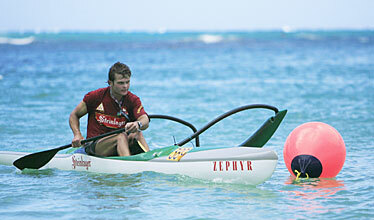 "
The daunting news for fellow surfski competitors is that Szadovszki says he probably will stick around for a while. "How can you not love this?" he asked, gesturing to the sun-splashed beach after the race. Maggie Twigg-Smith captured first in the long-course wahine surfski division, escaping the rough-and-tumble start unscathed, to finish in 2:25:27. Deanne Hemmings (2:38:38) finished second in the division. "The surf was good," Twigg-Smith said. "I started surfing right after Makapuu. It was windy, so it made the conditions perfect." Many of the solo paddlers are preparing for the Molokai-to-Oahu championship race on April 27; the surfski competitors are gearing up for their own Molokai world championships on May 18.